We found the tomb of the Twelve! There is a secret crypt which contains behind its seals and glyphs twelve elite warriors held by sacred strips and silver ties. Their sovereign has long passed away, but these servants of the dark forces remain a threat. A solitary guardian watches over them for eternity, preventing these sleeping abominations from rising and the intruders from entering their sepulcher. 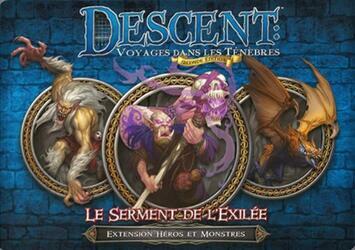 Legendary heroes and vile monsters burst into Descent: Journey into Darkness, Second Edition with Heroes and Monsters expansion The Oath of the Exile. Discover the assets and abilities of these creatures and characters by playing independently included quests, or through rumored cards. With its 4 heroes, 3 groups of monsters and 2 unpublished quests, The Oath of the Exile offers you all the necessary material to renew your Descent parts: Travels in the Darkness, Second Edition.